In the wake of the spread of the “syrian refugee crisis” into europe in 2015, anti-authoritarian, anti-fascist and anarchist groups in greece have created networks of mutual aid, of various kinds, in support of the migrants. Refusing any State or NGO mediated police charity, anarchists have been among the most active in organising self-managed spaces that have allowed migrants to determine collectively and autonomously, to varying degrees, their own lives. The okupation of abandoned public and private buildings for the creation of migrant-solidarity social centres has been perhaps the most notable expression of a territorialised solidarity that places networks of mutual, shared support before the logic of State controlled borders. 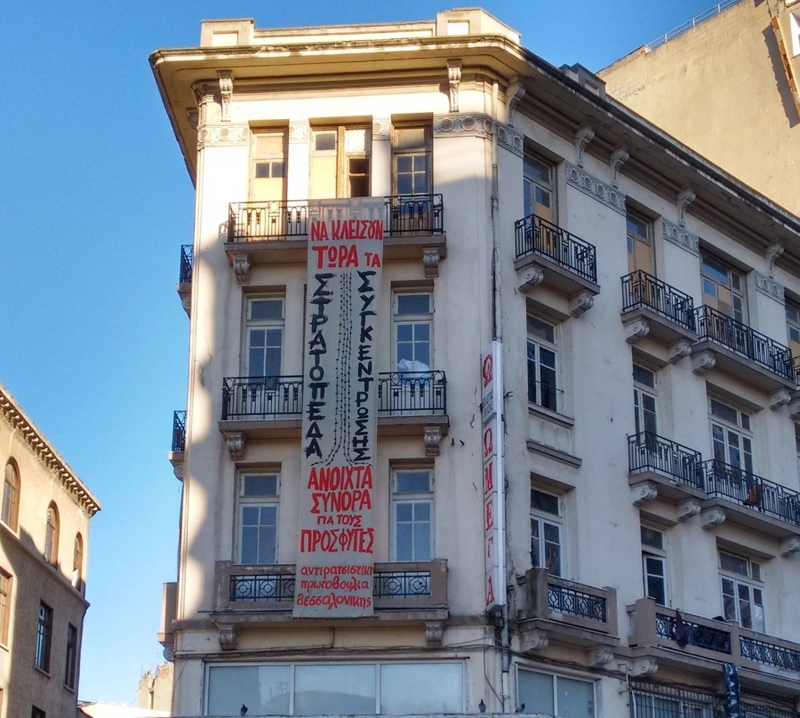 The Social Centre – ‘Migrants’ Place (Steki) was established in 2004 by Antiracist Initiative and since 2009 has its premises in the historic building of Ermou 23, in the city centre of Thessaloniki. Except from Antiracist Initiative, in its 3 floors, Steki hosts nowadays more than 20 political movements, labour, social and immigrants’ collectives, assemblies and initiatives, as well as theatrical and cultural groups. Several activities and collectives of material solidarity have been developed in Steki, like «Ektos Taxis» education group that provides free courses in natives and immigrants, Solidarity Kitchen that provides every weekend meals and company to hundreds of people, Room39 that collects and distributes NFIs and food in refugees and homeless, the Legal Team for the Protection of Refugees’ and Immigrants’ Rights and many other temporary or permanent projects. In view of these risks, we had no choice but to decide to collectively assume responsibility for the debt and ask for repayment by installments, although it is obvious that this debt has not arisen as a result of some action or lack of action on our part, but as a result of our decision to stand in solidarity – without considering the consequences – with a collective need in our city. Online donations can be seen at our campaign on YouCaring. We will soon provide a list with offline donations as well. This entry was posted in News blog and tagged greece, migration, Okupations. Bookmark the permalink.